भारतमें बाढो को सिंचाई के और सभी मौसम में अंतर्देशीय नौसंचालन में एक धारणीय स्त्रोत में किस प्रकार परिवर्तित किया जा सकता है? Yojana Magazine’s 2016-July issue, available for free download in English, Hindi and other vernacular languages. Instead of mentioning the state names, I could have clubbed them as ‘western and southern India’ but then it’d be difficult to fill 250 words. Each year, India receives average annual precipitation of 4,000 BCM. Out of this, ~2,000 BCM flow in the river system. However, more than 80% of the annual runoff in rivers occurs during the monsoon months of June-September. In real exam, you can’t recall all these examples. But atleast, Ken-Betwa & Beas-Sutlej should be remembered. Telugu Ganga Project aims to utilize the flood water of Krishna and Penna rivers to irrigate the drought prone areas in Andhra Pradesh’s Chittoor and Nellor districts. The Ken-Betwa link project aims to transfer surplus water from the Ken river through a canal to the Betwa river basin in Uttar Pradesh and Madhya Pradesh. Sujlam-Suflam Spreading Channel aims to transfer flood water from Kadana dam (Mahi river) to Sabarmati river in Gujarat. Periyar Vagai project aims to transfer of water from (west flowing) Periyar river to (east flowing) Vagai river. Kurnool- Cudappah canal, Beas-Sutlej link and the Rajasthan canal are other notable examples. While the associated canals are not large enough to facilitate long-distance inland navigation at present, but such examples can be seen elsewhere in the world. 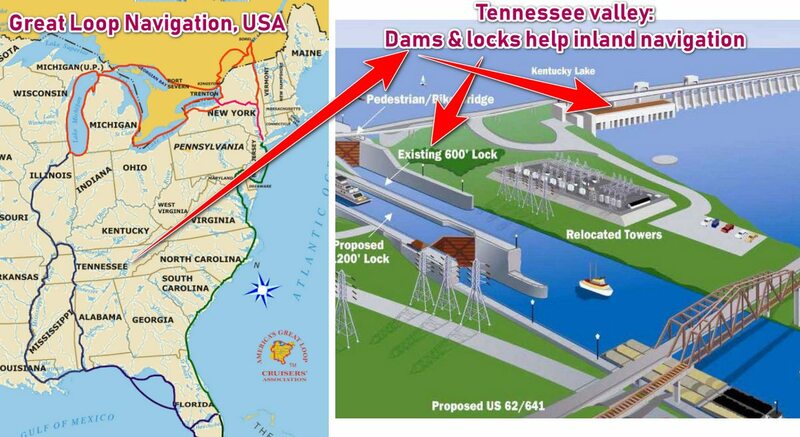 Such as the…..
Tennessee Valley Project in the United States: Apart from irrigation and hydroelectricity, it also provides navigation facilities in the states of Kentucky and Tennessee using a system of dams and locks. This channel also extends to Ohio river, and a host of smaller rivers.Taken together, this navigation system stretches 11,000 miles connecting Pennsylvania state in the North USA to Florida state in the South USA. ये देखो कितने बढिया तरीके से नदी-जोड़ के द्वारा जलमार्गो से पुरे उत्तर व् दक्षिण अमरीका को जोड़ा गया है…लेकिन भारत में साला कोई बात समजने को तैयार नही. Colorado River Canal System in USA, and Three Gorges Dam on China’s Yangtze river too provide both irrigation and inland navigation facilities in the respective regions, using dams to stabilize the water level for navigation during lean seasons. Similar potential exists in India e.g. Inland navigation over the river Narmada from Gulf of Cambay, to Gujarat to Madhya Pradesh can help in cheaper transportation of naptha, polymers and wide variety of chemicals for import and export. But that’ll require appropriate modifications in the Sardar Sarovar Dam in Gujarat, Indira Sagar and Omkareshwar dams in Madhya Pradesh. If Narmada is linked with Tapi river then it can further boost the inland transportation among Gujarat, Madhya Pradesh and Maharashtra. You don’t have to write the headings like “Body#1… Body#2…”. I’ve written those headings to help you see how I arrived at the conclusion. From the aforementioned solutions, it’s evident that: 1. Interbasin water transfer helps in the irrigation of drought prone areas, and reduces the vulnerability from floods.. 2. A system dams and locks aids in maintaining adequate water level in the rivers and canals for inland water navigation through out the year. Thus, a well planned interlinking of river project (ILP) with above components can help conserve the excess monsoon flows and, use this water in drought-prone areas for irrigation. Once these canals are built, they can also be used as waterways for the transportation of men and materials. These waterways can supply raw material to industries in areas that do not have road/rail links, and take their finished goods back to the market. They can even reduce the traffic congestion in the areas that have dense road/rail links. 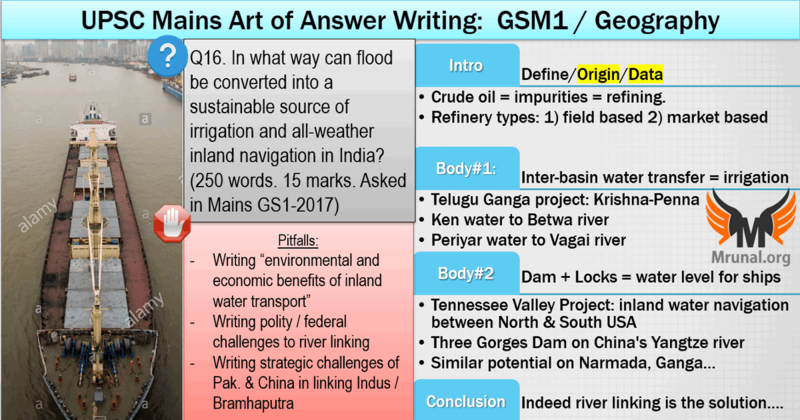 The question is not about the “MERITS of inland waterways.” So, don’t drag this further like how it can help industries, reduce GHG emission, climate change…Else you’ll deviate from the original question. The question is also not about the “Federal Challenges in interlinking of rivers” so, don’t drag into Constitutional / polity angles and the ongoing disputes among the states for sharing of river water. In 2012, Supreme Court directed the government to implement river linking project in a time-bound manner but Assam, Sikkim and Kerala protested that only they’ve exclusive rights over the use of their water resources. Question has keyword “sustainable source of irrigation” but it doesn’t mean you should write a longwinded story about “how ground water tubewells require diesel pump sets, GHG emission, water table decline, saline water ingress. So, it’s unsustainable..” UPSC has not asked to critically examine the sustainability of tube wells vs. inter-river canals. Normally how many pages of an A4 size sheet will it take(medium size of letters)? Sir.. Is it useful to write last year question answers?? Only for practice. They wont repeat.